This week's charts cover the period from January 21st to 27th. For the week of January 21st, 101 Digital's Color Bump 3D bumped Playgendary's Polysphere off the App store free downloads top spot, while Zhou Jiaping's Great Puzzle held firm at the summit of the Google Play marketplace. The week's newcomers were Homa Games' Tiny Cards in ninth on iOS and Mettel163's Uno (a partnership between Mattel and NetEase) in fourth on Android. FoxNext's Alien: Blackout was the only fresh game on the paid charts for the week, enterting the top 10 in ninth on the App Store and third on Google Play. 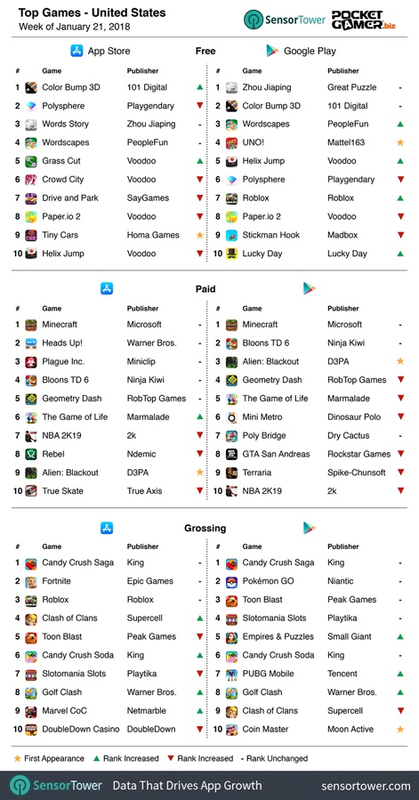 King's Candy Crush Saga was the top grosser across iOS and Android, above Epic's Fortnite and Niantic's Pokemon Go. The most downloaded game of the week across both the App Store and Google Play in the UK and Ireland was Moon Active's Coin Master. The hit title was also the top grosser on Android, hitting second spot on iOS, unable to usurp Candy Crush Saga from the App Store summit. Interestingly, while Pokemon Go is the third top grossing title on Google Play, it's missing from the App Store top 10. 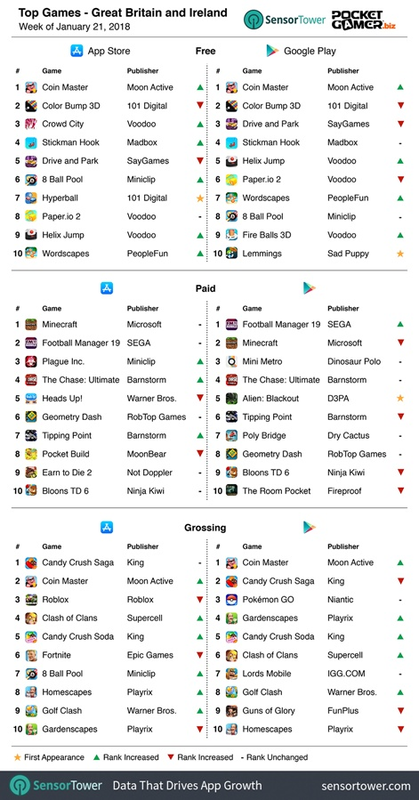 A big new mover in the grossing chart was Miniclip's 8 Ball Pool, which rose to seventh. There is nothing wrong with your screen. 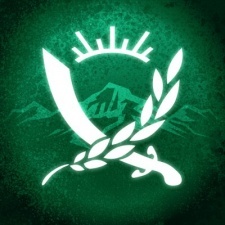 Do not attempt to adjust the picture. 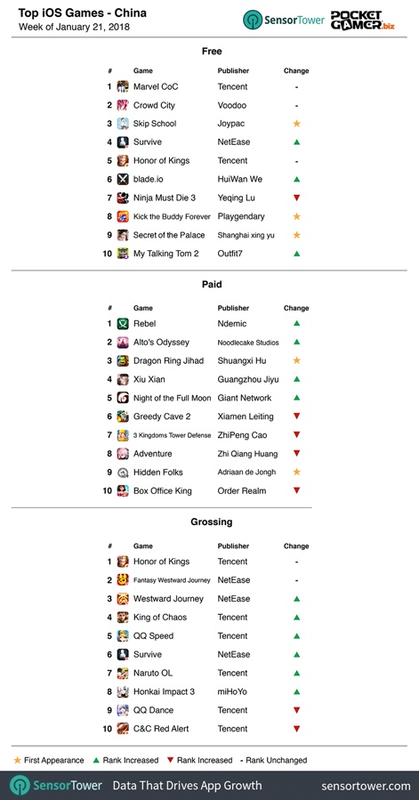 For the second week running a company other than Tencent and NetEase has made the top 10 grossing chart. The honours this time go to miHoYo's Honkai Impact 3, which entered at eighth. It takes the place of the previous week's entrant, Aniplex's Fate/Grand Order. The top paid rankings saw some love for Western developers. Adriaan de Jongh's Hidden Folks took ninth spot, while Team Alto and Noodlecake's Alto's Odyssey rose to second, and Ndemic's Rebel topped the chart.